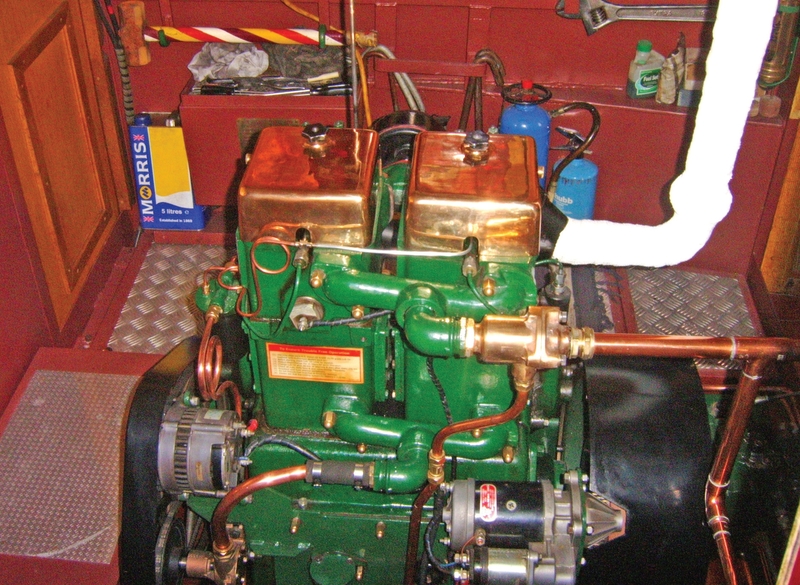 An interesting article of how one of Stationary Engines Parts Ltd Paramount Lister CS type engines was carefully marinised for narrow boat operation by Tony Redshaw Vintage Diesels of Northampton. The article is from the June 2013 edition of Stationary Engine magazine and was written by Kevin Parsons. From Dursley to Delhi - and return. There can be few owners of old marine engines that have not heard of Tony Redshaw Vintage Diesels. Tony, with his son Paul operate out of Braunston in a small yard adjacent to the Grand Union Canal and after hearing of a unique project they were undertaking, I decided to investigate. When I visited and was made welcome by Tony, I was astonished at what he had packed into his workshop and stores – a real engine-man’s workshop I decided. Every available corner was occupied by machinery, but sufficient space made to assemble and test a finished engine. Tony’s philosophy is simple – he will not let anything out of the works that does not meet his exacting standards. The only way to ensure this is to strip engines down to the last nut and bolt for a thorough clean and reassembly with repair as required, which brings us to the purpose of my visit. Some two years ago, Tony and Paul decided to create a new vintage style engine for narrowboat use. 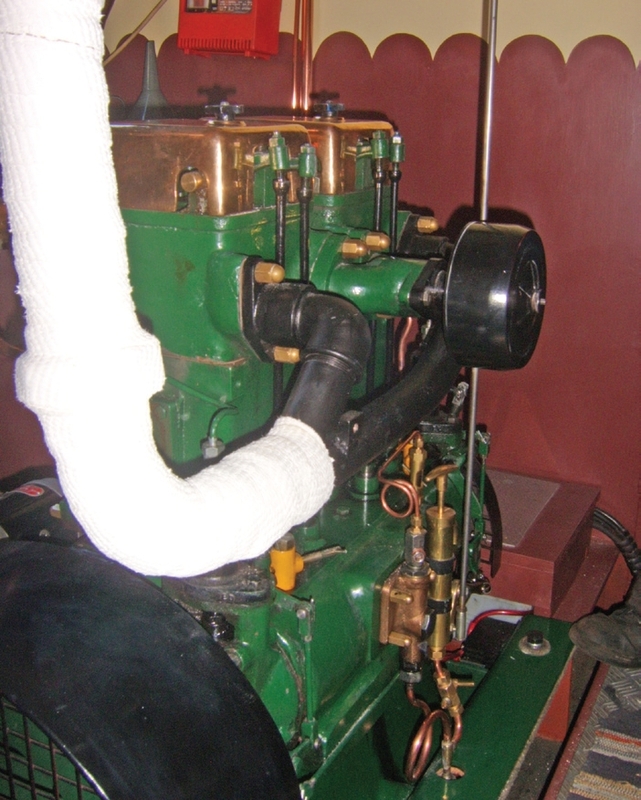 As there was no suitable British manufacturer they turned to York based Stationary Engine Parts Ltd with their extensive import experience and connections with India, in particular the Paramount range of Lister CS style engines from the Rajkot based Anand Enterprise. A 20hp two cylinder engine duly appeared at the works, where Tony and Paul began their unique project. By Christmas 2009, they had installed the result into their narrowboat “Percy” (ousting the incumbent Gardner in the process) and began “sea” trials. “Come and have a look” said Tony and as we walked to the boat, I asked about the build quality of the Indian engines. “Well, they are actually quite good but it’s also about the preparation. Once here, we stripped it completely, modified where necessary, fettled and carefully rebuilt it, developing modifications in the process, including the marinising. We also swapped the chromed bores for standard iron liners.” “Has it been reliable then?” I asked, to which the response of 350 trouble free hours since its installation was sufficient to convince me that they had the potential for a usable engine here. Through the side hatches, the unmistakable shape of a vintage style twin sat gleaming in the engine room on the boat. A pair of highly polished brass rocker covers topped off an engine that looked as if it had only just come out of the Dursley factory as opposed to from half way round the world via York. Its similarity to the original Lister design is virtually complete and a joy to see. Climbing on board, I could examine it more closely. Breathing through a normal air filter, the fresh air is injected with diesel from two separate pumps, as per Dursley style, before spent gases exit through a bespoke manifold via lagged exhaust to the sky. Cooling is thermostatically controlled to allow a closed keel system, with the added benefit of hot water for the domestic calorifer. Starting is via motor and ringgear on the flywheel. At the other end of the crankshaft, belts drive the 75 amp alternator and Jabsco water pump. An interesting feature is that the normal changeover low/high compression valve has been replaced by a glo-plug system developed by Stationary Engine Parts however, Tony assured me that so far, the engine has willingly started without the need to use them! A further refinement is the provision of a sump pump to make oil changes easier and a nice touch is a sight glass to confirm oil flow from the lubricating pump. Copper pipe abounds (sufficient to keep the Brasso pot in frequent use) and as I traced each one round to see what it did, I noted that the injector leak-off, that on the Dursley product was drained to a drip can, had been directed, much more sensibly, back to the fuel filter. A lovely throw-back was retention of the rocker spindle greasers, an essential part of the preparation-to-run routine that we engine men love. On n.b. Percy, the 3.1 litre engine drives its propeller via a hydraulic system. For the more conventional set up, a PRM 260D2 gearbox is proposed to get the 20h.p. (at 1000rpm) to where it is needed. As I took it all in, I asked Tony how he came to be doing his work. He started his working career in 1960 in a village garage, moving in 1973 to the industrial plant sector, before leaving that in 1979 and setting up his Vintage Diesel enterprise. Apart from the initial castings, all work on milling and manufacture is conducted in-house using time-honoured methods and real service. He is an official Agent for Gardner engines, specialises also in Lister products, but will tackle anything British. At once, I understood why his workshop looked as it did. As if on cue, an ancient Bolinder driven ex-working narrowboat slid past and I queried if his expertise extended to semidiesels. “Not normally, but I would help out if needed” came the response. Tony is clearly a skilled man. “Do you know what we had to do as an apprentice piece? We were given a hammer, chisel and a piece of 1/8th steel plate, with instructions to cut a perfect square out, capable of being reinserted any way! ”. Back to the engine and to prove it didn’t just look good, he flicked the ignition and the big twin burst into life, running up on the governor then settling back to a lovely slow tick over. As someone who loves old style engines, I would be quite content to listen to this all day. I must thank Tony for giving up his Saturday afternoon to show me the result of his labours.